At 01:41 Shrewsbury Volunteers along with a first alarm assignment were dispatched to Foundry Drive in Shrewsbury Township for a reported structure fire. Within minutes the assignment was upgraded to a structure fire with people trapped. 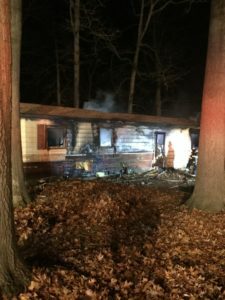 Engine 61-2 and Rescue 61 responded and were advised enroute Southern Regional Police Department are on location with heavy fire in the home, one burn patient outside and two confirmed people trapped inside. Chief 61 requested additional EMS units to be dispatched. Engine 61-2 arrived on location, gave an update to all incoming units, and deployed hose lines to attack the fire. Chief 61 and Rescue 61 arrived and assisted. Chief 61 assumed command and confirmed 2 people are trapped with crews trying to make entry. As additional units arrived and provided more manpower, crews were able to get into the basement. Two females were found unresponsive. Crews worked to remove the patients and get them to waiting EMS personnel. The victims removed were declared deceased by paramedics on the scene. The burn patient who was found by the police department was transported to York Hospital and eventually air lifted to Lehigh Burn Center in critical condition. Fire department crews continued fire attack inside the home and eventually controlled and then extinguished the fire. A large amount of debris inside the home and concealed spaces provided crews with difficulty in getting the fire completely extinguished. Pennsylvania State Police Fire Marshall was requested to the scene. Additional engines were requested for manpower. The PA State Fire Marshall arrived and conducted his investigation. As of 1pm the determination is the origin of the fire was in the southwest corner of the home. The exact cause is still under investigation. Fire crews finished their overhaul of the interior of the home to confirm there was no concealed fire. All tools and hose lines were picked up and the last units cleared the scene at 09:30 hours. The Shrewsbury Volunteer Fire Company extends our condolences to the families involved in this tragedy. Everyone is reminded that once you exit a burning building never re-enter. Statistics show people who re-enter a burning building do not make it back out. Families also should close the bedroom doors at night. Smoke and fire spread is decreased greatly with the doors kept closed while sleeping. Get Out and Stay Out, have a working smoke detector and always have a plan on how to escape your home. Be proactive with your family and have a plan to keep them safe. Shrewsbury Volunteers wishes to thank all Fire, Police and EMS agencies who assisted on this difficult incident. We also wish to thank J&B’s Grille on North Main Street in Shrewsbury Borough. They provided meals for crews upon returning to the station. It is the support of our businesses that help us through these difficult times.